MIDC, Andheri(E), Mumbai – 400 093. Synthetic Gold Brushes are of International quality with seamless nickel plated ferrules and perfectly balanced wooden handles. 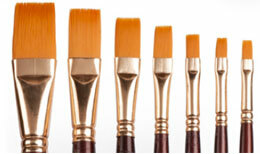 Available in round and flat brushes.